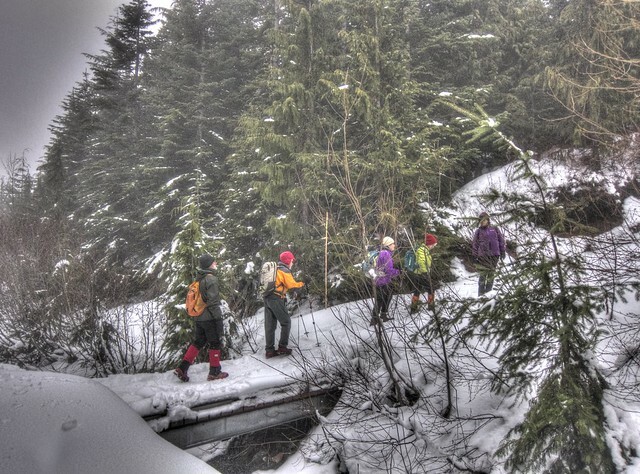 On January 26, 2019, eleven persons participated in this snowshoe trip jointly organized by Nature Vancouver and Friends of Cypress Provincial Park. Carpools were arranged at Park Royal and we assembled a second time at Black Mountain Lodge. Some, as the trail was well packed and not mushy, left their snowshoes in the cars and donned a variety of crampons, others, electing to be ready for any terrain, strapped on their snowshoes. We began our walk around Yew Lake, planning to gather at the picnic table at the far end of the Lake. This turned out to be difficult as the picnic table was nowhere in sight, hidden by several feet of snow. On around the Lake, through the meadow, past the little ponds (also hidden) and through the Old Growth. Then across the bridge, mercifully wide and stable on a solid snow pack and on up the switchbacks to Bowen Lookout. As we travelled up the trail the cloud cover travelled down so we were unable to look out very far from the lookout (or anyplace else), but this lack of a distant view forced us to enjoy views closer at hand: meringue snow drifts, misshapen marshmallow blobs on the tree branches, small bits of frozen water, tiny icicles hanging from the ends of small branches, and even tinier needles seeming to have been individually dipped in a frosty confectioner’s sugar. And, always, the croaky call of ravens near and far. Famished, we all tucked into our lunches, only realizing as we had emptied our lunch containers that it was only 10:45! At the lookout we enjoyed the company of 3 or 4 leash-less dogs, and were charmed by a family introducing their young child to the wonders of the world of snow. And, of course, steller’s jays and whiskey jacks were also interested in an early (or anytime) lunch. As is often the case when hiking in the snow, surrounded by cloud, we began to get cold and were soon ready to move on. Two elected to return the way we had come; the rest continued 20 minutes up the trail to the Binkert Lookout where, still in the cloud cover, they were forced to imagine the view of the Lions in the far distance. By a miracle of synchronicity the two groups converged at the bottom of the ski run, and united in giving Anne and Bill a heartfelt thank you for leading us out into the urban wilderness. Though the downhill ski slopes were busy and all parking lots full, we met few people on the trails we took; and just one largish group who, fortuitously, were leaving the Lookout just as we arrived.